Dr. Alex runs comprehensive, in-depth examinations of newborns, infants, toddles and children of all ages to be sure they are hitting their developmental milestones. These consultations and examinations look at a history of the child with over 100 or more different functions. These examinations can reveal a novel approach to aid in developmental disorders, ASD, eating disorders, failure to thrive, and more. Dr. Alex takes this very seriously. Separate times of 1-2 hours are aside to explain all aspects of the exam and findings to the parents. Most importantly time is spent showing them what can be done about it to help children overcome a variety of developmental delays and disorders. Post examination, if there are findings to bring out more of your child’s potential, Dr. Alex will inform you if he or she needs to make regular visits for rehabilitation, and/or peform exercises at home on your own. It has been estimated that 26% of children have some type of learning disability, and that number is only increasing with time. The sharp increase can be explained by the concept of epigenetics. In short, the term epigenetics refers to changes that occur in a population that change the genetic expression of individuals. The causes of epigenetic changes are environmental factors. Moreover, epigenetic changes seem to increase in intensity with each generation. At Fountain of Life Family Chiropractic our treatments for all types of learning disabilities are based in functional neurology, functional medicine and chiropractic, hence our overall functional approach. Treatments are tailored specifically to engage weakened neurological pathways in either the right or left hemisphere of the brain, reduce systemic inflammation, and create a more balanced environment for brain development and function. We do this by first sitting down with the parents and the child to determine what is going on, what have you tried in the past, and most importantly what do you want for the future? A tailored program consisting of functional neurological rehabilitation, nutrition, and or chiropractic will be devised based on your goals and desires as a parent and what we think is best for your child. What are some of the things your child’s needs prevent you from doing right now? What does you and your child’s situation look like 5, 10, 15 years from now? Proper neurological function is a step by step, integrative process for the brain. Each step depends on the one before it for normal function to develop. Dr. Alex runs comprehensive, in-depth examinations of newborns, infants, toddles and children of all ages to be sure they are hitting their developmental milestones. These consultations and examinations look at a history of the child with over 100 or more different functions looked at. Dr. Alex takes this very seriously. Separate times are aside to explain all aspects of the exam and findings to the parents, and most importantly, showing them what can be done about it to help children overcome a variety of developmental delays and disorders. It starts with primitive reflexes, these are automatic, repetitive movements that are essential for head control, muscle tone, sensory integration and development for infants. They’re essential for survival in the womb and the first few months of life. As higher cortical centers in the brain develop, the next step, integrating postural reflexes occurs. Postural reflexes allow a baby to hold their head up, sit up, stand up, and begin the locomotive process of rolling over, crawling and walking. After postural reflexes are integrated, sensory processing begins to develop. Being that sensory processing requires quite a bit of higher cortical brain centers, that is followed by gross motor control (big muscles), fine motor control (hand coordination), cognition abilities, academic skills, and finally social, emotional and behavioral components come in to play. All of which require the cortex for operation. Proper neurological development (including hitting milestones) is like an iceberg. 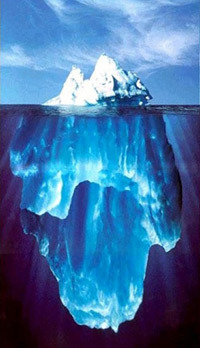 90% of the iceberg is under water, 90% of neurological development is under the water as well. Primitive and postural reflexes, sensory processing, core and fine motor control are all under the water. It is the cognitive, academic, emotional, and behavioral are the remaining 10% above water. That iceberg would not be in the water without the 90% underneath it, nor are all of the higher functions that we want to see be done well with our kids like good school work, social interactions and sports performance. If a baby becomes startled, or the head or neck is not supported, the baby will thrust its arms out and then curl them in and brace themselves. If retained: The child can be hypersensitive to other senses, be in chronic fight or flight which leads to adrenal gland stress hormone output and lead them to be fatigued, and/or get sick often with colds, flus, ear infections, asthma, and allergies. The child will also be unable to focus, have emotional immaturity, anxious, aggressive or highly excitable and have difficulty playing at ball games. If you stroke a baby’s face, the mouth will move towards, or the head will turn towards that side because they are looking for food. If retained: The child could have poor articulation, messy eaters, poor tactile sensation of the face. If someone puts a finger, or small object into a babys hand, it will instantly grip it. If retained: poor hand writing, inability to hold a pencil/pen properly and poor ability to move hands in general with fine motor skills. When a baby lays on their back and turns their head, they will raise their limbs on that side. This is the start of developing hand-eye coordinated efforts. If retained: Contribution to scoliosis, difficulty with reading mechanics, difficulty in sports that involve moving their limbs across midline of their body and difficulty with tasks that involve both sides of the body. To help the baby crawl, this reflex helps extend the arms and bend the knees. As the baby progresses this reflex disappears and higher cortical areas of the brain take over the task of crawling. If retained: Tendency to slump, sitting in a “W” position, wide posture while walking, and being clumsy. If a baby lays on their back and their lower midback-upper lowback is stroked, they will wiggle. This reflex allows the baby to “wiggle” and propel themselves out the birth canal. If retained: Signs of poor concentration, poor posture, bed wetting beyond age 4, figidy while trying to sit still, and digestive issues. While holding a baby in a face down horizontal position and push their head down, the rest of their body should flex and curl as well. If retained: Poor balance, awkward movement with legs while walking or running, and inability or difficulty propelling their body to jump or skip. If a baby lays on their back, tilting their head back more will cause their legs to straighten, stiffen and push together and the arms will bend at the elbows and wrists. This is the last of the reflexes to integrate. Most all other reflexes must be gone by the age of 12 months, this one may be present up until 3.5 years of age. If retained beyond 3.5 years of age, it can contribute to poor posture, poor balance, motion sickness, toe walking, increased or decreased muscle tone, and poor sense of rhythm/timing.